Intense is not the first name when you think about bikes that are built to go uphill fast. The American brand is most famous for machinery that can bomb down faster than most others, and it's been instrumental in the development of many of the sport's fastest downhill race bikes. 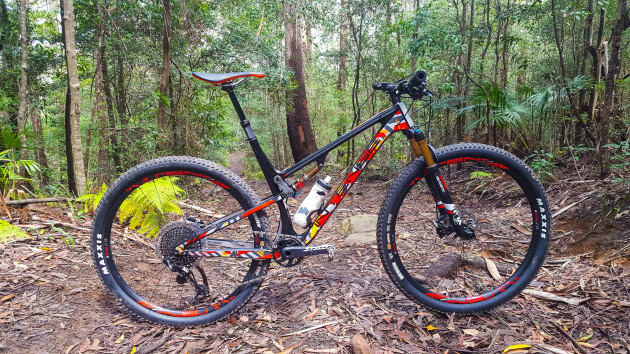 Its new Sniper, however, is aimed at the other extreme of mountain biking. At just on 11.1kg fully laden in a large size (with tubes, pedals and a cage! ), just 100mm of travel front and rear, and not a slack angle to be seen, the Intense Sniper XC is built to do just one thing. But is it too limited in its appeal? We scored a few days on Intense's brand new Sniper before its worldwide release, and we'll have a full wrap up in the next issue of MBA, out in April. 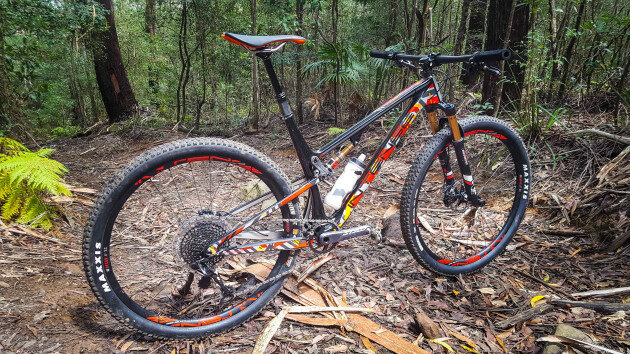 The Sniper is an all-new design for Intense, and is based around a full carbon frame with a four-bar linkage suspension system with 100mm of rear travel and a 12mm x 148mm rear end. It comes in a 29-inch wheel size only, and is available in small through extra large sizes. This thing has been built from the ground up for speed. The SL chassis uses a magnesium upper link a and carbon lower to save even more weight, while there is nothing on this frame that is unnecessary; even the internal cable routing does away with extra plastic fittings; rather, it just feeds through holes moulded directly into the frame. A big change for the American company is a recent move to consumer direct sales, although its existing Aussie dealer group is still in play. This is, the company says, "a move to bring the brand down from a perceived premium price point." While the example that we're testing today costs around $10,500, the exact same chassis - save for the magnesium upper link that's unique to the top spec SL frame - can be had in a complete bike that costs no more than $5500. The XC Elite that we got a brief blast on runs SRAM Eagle XO combined with Shimano XT brakes, a Fox Factory 32 fork, Intense's own Recon carbon/DT Swiss wheels and Maxxis Rekon tyres. There's also a 50mm stem and 760mm wide carbon handlebars, topped with ultra light foam grips. All Snipers, too, come with a 125mm drop carbon version of KS's excellent LEV post (though it misses out on a Soutpaw trigger). There's even room for a small bottle. 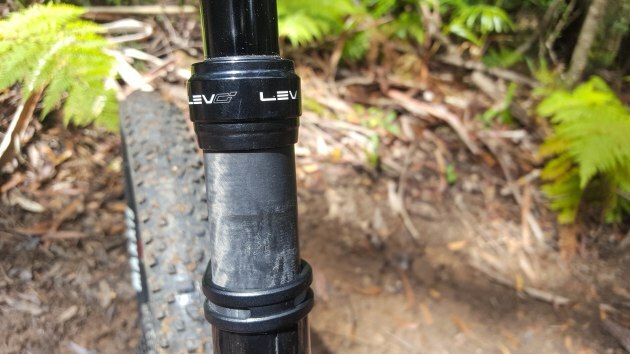 Out in the dirt, the Sniper literally feels like it wants to bolt for the trail head. With a big boy 34-tooth cog on the front of the 12-speed set up, the Sniper is an efficient pedaler with a stable nature. 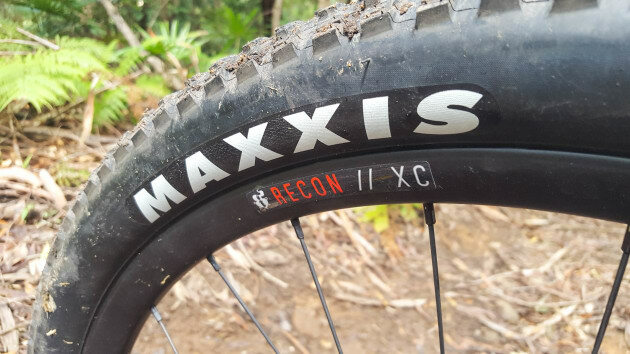 Point the bike upwards, and despite the low-profile tread of the Maxxis Recon 2.25 tyres, the Sniper simply motors up and over any obstacle in its path. On rolling single track, it's a similar feeling. With a sharper front end than most trail bikes, the Sniper is a joy to muscle through tighter, flowy terrain. It absolutely laps it up, especially through that longer front end. It almost steers by thought. With a wider handlebar and the longer front centre (its reach measurement is a lengthy 468mm), there is front grip to burn, and it's faithfully backed up by the stable, planted rear end. In terms of fit, it's long and low, with a stretched-out 635mm top tube combining with a short 105mm heat tube and a modest 778mm standover height. 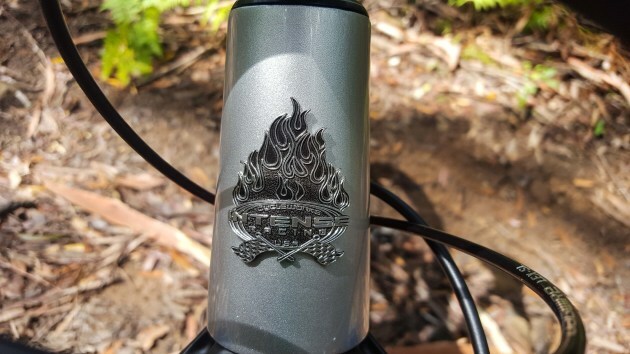 We didn't feel the need to dump the stem on the frame during our brief ride, which is unusual when testing 29ers. The kink in the Sniper's armour is when descents get rowdy. Despite a 67.5-degree head angle, its shorter travel numbers soon overwhelm the bike's ability to tackle truly massive terrain at speed, though that inherent stability and manoeuvrability does play into its favour. The lack of travel, too, requires a more precision set-up of the Fox DPS rear end and surprisingly capable 32 front. We'd guess that the Sniper is better suited to lighter riders who aren't taking up a lot of sag from the box. Our 100kg rider set it up for 20 per cent sag and while it pedalled amazingly well, it lost the ability to deal with bigger stuff, and became a bit wooden and non-responsive. Of course, we had next to no time on the bike, and more time aboard would have yielded a sweeter tune. Intense is also realeasing a 120mm version of the Sniper called the Trail, and we reckon that may well be the sweet spot for all-day missions where the rough is mixed with the smooth. We'll bring you a more comprehensive test of the Sniper XC in the mag, but suffice to say the Sniper is an impressive device out of the box, especially if you're into long distance sufferfests. As a marathon bike, for example, it would be brilliant. And the fact that you can get a SRAM Eagle GX/Shimano XT/FOx equipped version for $5500 is pretty darn good, as well. Check out our April issue for more pics and a comprehensive review.